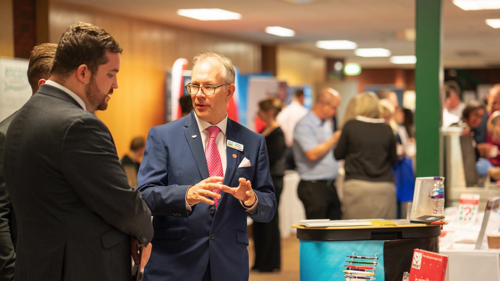 The 2019 Worcestershire Festival of Business will be held on Friday 13th September at the iconic Chateau Impney Hotel in Droitwich. Now in its sixth year, the annual celebration of Worcestershire enterprise and entrepreneurship returns to The Regent Centre, Chateau Impney after exhibitors and visitors hailed the 2018 event a huge hit. With the location ideally placed for M5 access the event attracts business visitors from both North and South of the region. Last year visitors travelled from as far afield as Leeds and London. Prior to the main exhibition there is a breakfast networking event being run by Sterling Networks. Last years’ event was a ‘sell out’ with 150 attending, so we have moved to a larger room for this year. The event supports a locally based charity each year and for 2019 that will be Leukaemia Care UK based in Worcester. Exhibitors and potential sponsors are urged to contact Stuart as soon as possible. Exhibitor opportunities start at just £95 to encourage businesses to attend that have never done a business exhibition before.